Western Digital has expanded its Purple lineup of hard drives, aimed at video surveillance applications, with a 10 TB helium-filled HDD. The drive is optimized for write-intensive workloads and supports various technologies that minimize the number of potential errors due to the high-number of incoming data streams. The new WD Purple is also the company’s first 10 TB HDD with a 5400 RPM spindle speed and a large cache. The WD Purple 10 TB drive (WD100PURZ) is based on the HelioSeal platform featuring seven PMR (perpendicular magnetic recording) platters with ~1.4 TB capacity apiece, which it inherited from last year’s top-of-the-range HDDs. The increased areal density of the platters allowed the hard drive to increase its sustained transfer speed from host to drive to 210 MB/s, or by ~18% compared to the previous-generation helium-sealed WD Purple 8 TB HDD (WD80PUZX, 178 MB/s). This is at the same 5400 RPM spindle speed and at a slightly lower power consumption (up to 6.2 W vs up to 6.4 W). Just like other hard drives with a 10 TB capacity, the new WD Purple is equipped with a 256 MB DRAM buffer, which may further increase the real-world performance of the HDD against its predecessors. Since the WD Purple hard drives are purpose-built for video surveillance applications, they support the ATA streaming extension of the SATA standard as well as a number of WD proprietary technologies, including AllFrame 4K cache policy management and firmware enhancements to optimize data flows during playback and writing. 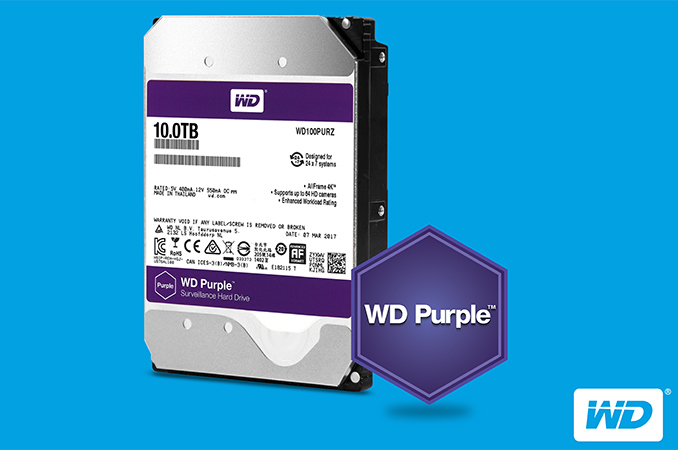 All WD Purple drives can work with up to 64 cameras and are rated for a 180 TB/year workload. In addition, high-capacity WD Purple HDDs are optimized for operation in NVRs and DVRs with more than eight drives and support time-limited error recovery technology (TLER), which prevents drive fallout caused by extended HDD error recovery processes. 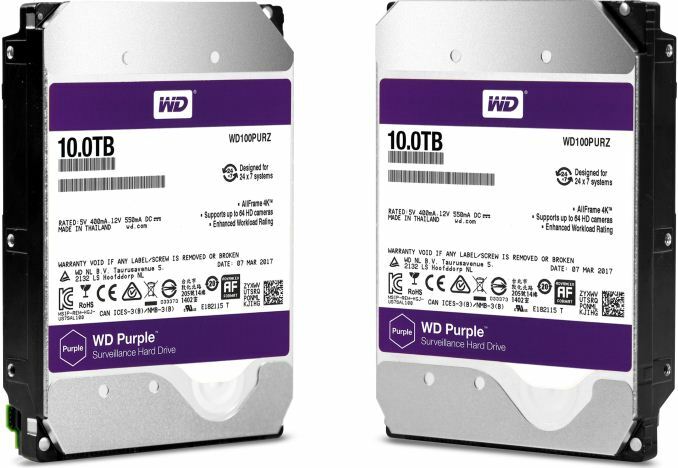 Western Digital claims that the new WD Purple 10 TB is compatible with new and existing video surveillance systems (including chassis, chipsets, etc.) and thus can be used for new and current deployments (except those that require drives with 512B/512e sectors – the new WD Purple only support 4Kn sectors). The manufacturer has already started to ship the new hard drives to its partners and they will be available shortly for $399.99. While the addition of a 10 TB HDD into the WD Purple series is a significant event, the fact that Western Digital began to roll out 10 TB helium-filled hard drives with a 5400 RPM spindle speed is even more important (until recently, WD used to offer only 8 TB helium-filled 5K HDDs). With the introduction of a 10 TB product with a reduced spindle speed, Western Digital can launch WD Red and WD My Book hard drives of the same capacity in the coming weeks or months. Meanwhile, it is interesting to note that recently Western Digital cut down the price of its WD Purple 8 TB HDD by 30% and it can now be acquired for $281.99 from Amazon.